One year we almost forgot Halloween. I was not even in first grade yet so the peer pressure of what costume to wear had not even crossed my mind. My mother was too busy trying to sell a house and having a sick mother to think about instead of getting us kids a costume. Suddenly it was October 31st and we remembered that it was Halloween. We rushed to the local Big B Drugs or Eckerds Pharmacy only to be disappointed with what was left. The choices came in those plastic masks that just covered your face and were formed into a Saturday morning cartoon character or the cheap latex masks that were so over the top in the horror department that no one wanted them. My mother opted for the plastic mask that year with the matching garbage bag you wore over your clothes. 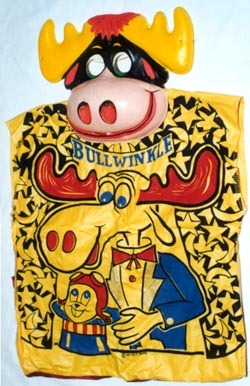 This always had the cartoon character’s body on it. My brother was Rocky the Flying Squirrel and I was Bullwinkle J Moose. The mask was a little over sized, I remember the elastic band that secured to the mask by metal staples inside the mask,that would always pull my hair and scratch the side of my face. What torture a child endured for a Bit-o-Honey or a vanilla Toostie Roll. By the end of the night my antlers were mangled by having them slammed into the car door every time I closed it. I do remember I got quite a lot of candy that year. I was fonder of Rocky and Bullwinkle after that Halloween. I watched them more often after that and once they started reruns when I was older I got the adult comedy that was in the show as well. Rocky and Bullwinkle ran as a new show from 1959 to 1964 on ABC them moved to NBC. It has been running in syndication ever since. At one time it was the highest rated daytime network program. The characters of Rocky & Bullwinkle were, created by Alex Anderson Jr., Anderson has died at the age of 90. Anderson is credited with developing the first cartoon series created for TV, Crusader Rabbit. He also create another well know cartoon about a dim-witted Canadian Mountie called Dudley Do-Right. In 1999 this was turned into a live-action film starring Brendan Fraser as Do-Right . Some of my favorite things to watch on TV are the British comedy TV shows. Shows like, “Are You Being Served? “ “Vicar of Dibley,” “Red Dwarf”, “One Foot In The Grave”, have always been among my favorites. I would rather watch an episode of “Keeping Up Appearances” than an hour of “Law and Order.” If there is one thing I love about our local PBS station it is the Saturday night Brit-coms. It is the story of two highly strung residents of a retirement home who cause madness and mayhem for the management and their families. The series ran from 1990 to 1994 on the BBC but has achieved cult status in the US in reruns. 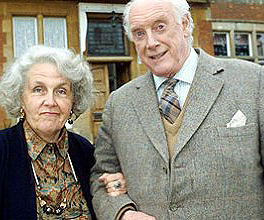 The show starred Stephanie Cole and Graham Crowden as Diana and Tom. It is Graham Crowden that has died at the age of 87. I have followed Crowden’s career as he was one of these quirky character actors that would pop up in many of my favorite films. He played as the Master of Lunacy in “The Ruling Class” (1972) with Peter O’Toole and as the Leader of Fanatics in “Jabberwocky” (1977) directed by Monty Python’s Terry Gilliam. Other films include the James Bond film “For Your Eyes Only” (1981), “Out of Africa” (1985), and 2003’s Calendar Girls. He stared with actor Malcolm McDowell in three movies: “If” (1968) , “O Lucky Man!“ (1973) and “Britannia Hospital” (1982).He has been in several other TV series including the British period pieces “The Way We Live Now” ( 2001) and “Vanity Fair” (1998). It was also rumored that Crowden was offered the job of the 4th Doctor Who for the TV series but he turned it down. Most recently I have enjoyed Graham Crowden’s voice in the BBC’s sci-fi comedy “Nebulous”. He played Sir Ronald Rolands, the main character, Professor Nebulous’ boss and leader of K.E.N.T. – the Key Environmental Non-Judgemental Taskforce. Oscar-winning actor, political activist and American Icon Charlton Heston has taken his Final Taxi at age 84. I have so many favorite memories of this wonderful film actor. Just after President Clinton signed the Brady Bill into law ( the law where you have to wait 5 days before you get a handgun) Heston showed up that week on Saturday Night Live. Heston, during that time, was the spokesman for the NRA and he played in one of the fake SNL ads. This was for the NRA Gun Loaner Store. While you are waiting your 5 days for your registered gun the NRA would loan you a gun of similar style. They even had a rent two guns and get the third one free. It was one of SNL funniest moments thanks to Heston having a little fun himself. Charlton Heston appeared in or leant his vocal talents to nearly 300 films, documentary films, TV shows and specials. Born John Charles Carter on Oct. 4, 1923, in Evanston, Ill, Heston lived an almost idyllic boyhood, hunting and fishing. He entered Northwestern University’s School of Speech in 1941 on a scholarship from the drama club. While there, he fell in love with a young speech student named Lydia Clarke. They were married March 14, 1944, after he had enlisted in the Army Air Forces. It was a marriage that lasted over 64 years. After the war,he made his Broadway debut in Shakespeare’s “Antony and Cleopatra” as Proculeius, Caesar’s aide-de-camp. He changed his working name with a combination of his mother’s maiden name, Charlton, and the last name of his stepfather, Chester Heston. In 1949, he attracted the attention of veteran film producer Hal Wallis. Without an audition, Wallis signed Heston to an independent contract for five pictures with the option he could accept other roles. Heston’s first picture for Wallis was the 1950 film noir “Dark City” in which he played a troubled World War II veteran, and the film did respectable business. Two films from the 1950s defined Charlton Heston’s screen persona. He became the go-to-guy for historical figures following Cecil B. Demille’s epic “The Ten Commandments.” His larger-than-life Moses was memorable. For years we knew that ABC would give us a re-air of this classic every Easter. In 1959 Charlton Heston again starred in a biblical epic. This time, the depth of his performance as a Jewish Prince who comes to know Christ with his heart and mind showed that Charlton Heston was an outstanding actor. William Wyler’s “Ben-Hur” is considered the greatest film of Charlton Heston’s career. His Best Actor Oscar was well deserved. Heston was wonderful as the artist Michelangelo struggling to paint the Sistine Chapel ceiling. In the classic 1968 film “Planet of the Apes” Heston played an American astronaut that hated his world so much that he was willing to go on a space trip that would take him away from his time forever. Instead of landing back on their own Earth many years later it was a world full of human- like primates. When Heston is captured he spouts a classic line, ” ..Get your hands off of me you damn stinking ape…” The sci-fi classic spawned a series of feature film sequels, a TV series and a remake in 2001. Charlton Heston appeared in the first sequel “Beneath the Planet of the Apes” . You should dismiss the recent Will Smith remake of “I Am Legend” and instead rent Heston’s 1971 sci-fi film “The Omega Man.” Heston is Dr. Robert Neville the last man on earth and it follows the book more closely that the current release. He stayed with sci-fi in 1973’s “Soylent Green” and it resulted in a classic of the genre. Heston played a homicide cop who was coming too close to the secret of a new food that is feeding all the starving people of the world. The last line of that film is also a classic. The 1980s saw Charlton Heston move from the film to TV. He was best known to 1980s TV fans as Jason Colby in the TV series “Dynasty” and its spin-off “The Colbys.” Mr. Heston returned to directing with the 1988 TV version of “A Man For All Seasons.” Heston played Sir Thomas More opposite John Gielgud and Vanessa Redgrave. Charlton Heston was active in civil rights during his lifetime. He marched with Dr. Martin Luther King Jr. and fought to end racism in America. He was present in Washington D.C. when Dr. King delivered his “I Have a Dream” speech. As president of the NRA from 1998 to 2003 Heston drew heat from anti-gun rights activists. He was President of the Screen Actors Guild for six terms; he received the United States Presidential Medal of Freedom, the country’s highest civilian award. Sister Carmen Burg of the School Sisters of Notre Dame in Mankato, Minn., found a unique way for her nuns to continue to help others — even after death. In 1986, she gave a researcher the go-ahead to begin a study in which the nuns would agree to be studied as they aged, then would donate their brains when they died. Sister Carmen, 84, took her Final Taxi last week after complications from diabetes at the Good Counsel Convent . The nun was one of 678 members of the School Sisters of Notre Dame in the U.S. are participating in the Nun Study, a longitudinal study of aging and Alzheimer’s disease initiated in 1986. The homogeneous life style of the nuns makes them an ideal study population. Convent archives have been made available to investigators as a resource on the history of participants. The study has found that nuns who expressed more positive emotions lived significantly longer — in some cases 10 years longer — than those who voiced fewer positive emotions. For the study, researchers drew the nuns’ blood, pored over their medical histories, studied their upbringing, read their journals and even autopsied their brains — all in an effort to unlock clues to the cause and prevention of Alzheimer’s disease. The Catholic nun held a variety of leadership posts for the order and the Archdiocese of St. Paul and Minneapolis. But her most lasting legacy may be what is caled “The Nun Study,” which originally consisted of 678 members of the School Sisters of Notre Dame religious order from all across the country. All were between 75 and 106 years old. School Sisters of Notre Dame is a worldwide order of Roman Catholic nuns devoted to primary, secondary, and post-secondary education. The order was founded in Bavaria in 1833 during a time of poverty and illiteracy. Its founder, Mary Theresa of Jesus, formed a community with two other women to teach the poor. In 1847 Mother Theresa and five companion sisters went to America to aid a group of German immigrants in rural Pennsylvania. That same year the sisters staffed schools in three German parishes in Baltimore, Maryland: St. James, St. Michael, and St. Alphonsus, as well as opening the Institute of Notre Dame, a private school for German girls. Eventually the sisters traveled as far west as Mankato, MN, establishing several missions for their order.. The Minnesota sisters began the study in Mankato in 1986 and expanded in 1990. Among the provisions of the study: the sisters agreed that upon their death they would donate their brains for storage and research at the University of Minnesota. Sister Mary Joyce Pietsch of the School Sisters of Notre Dame said Sister Carmen approved the study because it was a great way for the nuns to educate and serve even after death. What a way to continue with your calling from God.